Mobile gantry crane is an innovative solution for working areas that require on-site material handling. It is capable of handling small to heavy loads in workshop, workstation, freight yard, container terminals and port. The mobile overhead gantry cranes can be constructed into different forms and sizes for your needs. 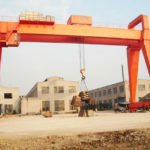 This lifting equipment is available in multiple types, and it can be divided into mini mobile gantry crane, lightweight mobile gantry crane and heavy duty mobile gantry crane according to the load capacity, rubber tyred gantry crane and wheel mounted gantry crane according to the crane running mechanism. The mobile gantry cranes are with many valuable features as they provide great flexibility, maneuverability and accurate positioning for lifting operations. Why Utilize A Mobile Gantry Crane? The big strong points of mobile crane is great mobility and flexibility in the lifting movement. Rubber tyred design or heavy duty castors allow it to reach anywhere in the confined space readily and effortlessly. It is a cost-effective solution that provides reliable lifting operations. The mobile crane will enormously increase production for your business. The mobile overhead gantry crane is extremely versatile as it can be adapted to many different working occasions or production lines. The gantry crane produced by our factory is custom designed and made to your requirements, thus it will suit a wide range of possibilities and lifting needs in the workplaces. Modular deign makes it convenient to assemble and disassemble the device, and also easy to use. The gantry lifting equipment is made to last and requires minimal maintenance. It will ensure a safe lifting operation through introducing several protection devices, such as overload protection device and anti-swaying device. The movable gantry crane can be customized to suit a wide range of applications, and it is designed for both indoor and outdoor uses. In many cases, material handling issues are quite complicated, so our mobile overhead gantry crane offers a reliable and versatile way to lift and move loads as well as an economical solution to crane users. Thanks to its strong mobility, the gantry lifting equipment can be applied virtually anywhere. For small and lightweight lifting applications, the small mobile gantry cranes are made to order. They are more often portable units with heavy duty castors attached to the cranes. Therefore, it is easy and effortless to move the mobile small gantry crane anywhere within working areas as well as transport from one workplace to another. 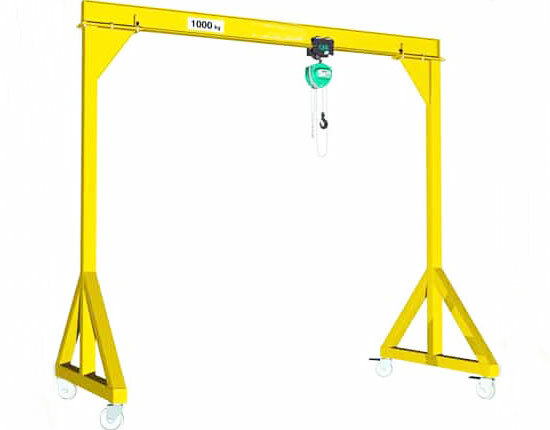 The portable gantry crane has light dead weight and is able to handle heavy loads up to 10 ton. 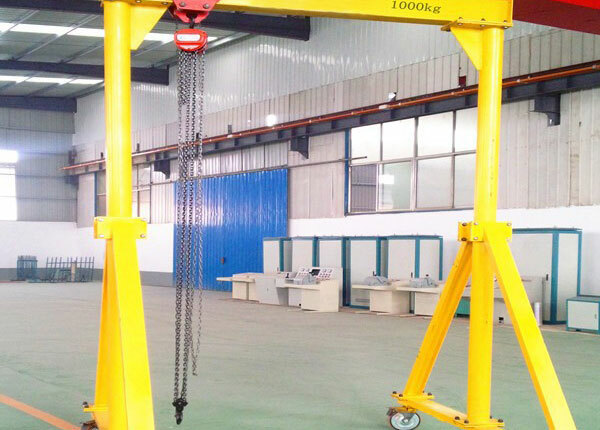 In addition, there are multiple options available to meet different needs of clients: steel or aluminum structure, fixed or adjustable height and span designs, 0.5 to 10 ton lifting capacity, manual chain hoist or electric hoist, manual gantry crane or powered mobile gantry crane. 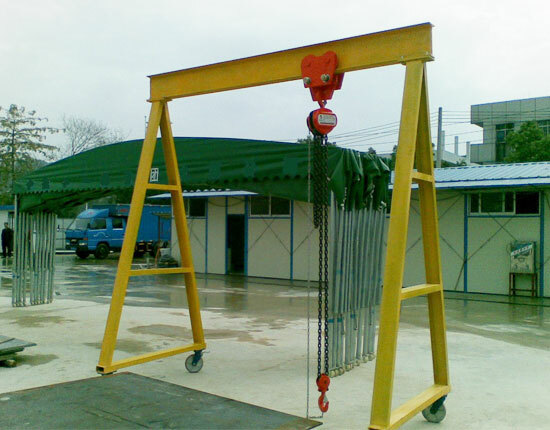 To meet heavy duty lifting needs, large mobile gantry crane can be customized and made. It usually comes in rubber tyred type, extensively applied in freight yard, shipyard, rail terminals, quay and port to handle large cargoes, such as the stack of containers. The mobile container gantry crane utilizes tire chassis to travel around, thus it provides lifting operations with maximum flexibility and efficiency. 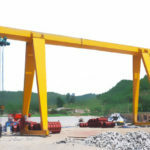 The rubber tired gantry crane can handle a large amount of weight, such as 30 ton, 50 ton and beyond. 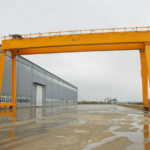 In addition, there are some other types of mobile overhead gantry crane for you to choose from, such as mobile workshop gantry crane, travel lift mobile gantry crane for marine, industrial mobile gantry crane, and a-frame mobile gantry cranes. Contact us now for further information. 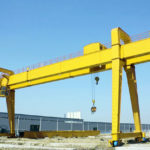 How to Ensure Mobile Gantry Crane Safety? Gantry crane safety is a critical issue in the lifting operation as it will be easily destroyed by human errors or crane malfunctions. The material handling process is rather complex, so crane users and operators should take safe operation as top priority. Here are some tips for safe use of mobile gantry crane. Notes for crane owners and operators. 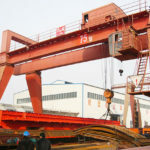 The crane owners should ensure that the equipment is purchased from reliable suppliers and is also in solid construction. Besides, they should conduct a thorough inspection on a regular basis like once a year. The workers who are going to operate the crane must be rigorously trained on the knowledge and expertise of gantry lifting equipment. During operation, they must strictly follow operation manuals and avoid misuse of the crane. Daily check for traveling gantry crane. The crane operators should conduct a check daily before use to make sure it is in good working condition. The checks include critical components of the crane such as hoist, hook, wire rope, limit switches and control system, any unusual sound or vibration. Safety precautions. Some protection measures should be taken to ensure the crane is safe to be used. For example, the equipment can be equipped with several protection devices such as overload protection device, anti-collision device and anti-swaying device. In the event of heavy rain, electric gantry crane for outdoor uses is also suggested to be equipped with rain cover. Notes for operational safety. There are some safety considerations for operators and other staff when operating the crane: check the working environment to see if there are safety hazards; if in doubt, do not hesitate to ask; do not overload; in no circumstance should a worker stand under the load; make sure the load is properly rigged. Proper maintenance. The crane and its components must be periodically maintained. In the event of damage or wear and tear, an in-time repair or replacement should be done in case it endangers the operator or other workers. In addition, a preventive maintenance is also necessary to ensure gantry crane safety. 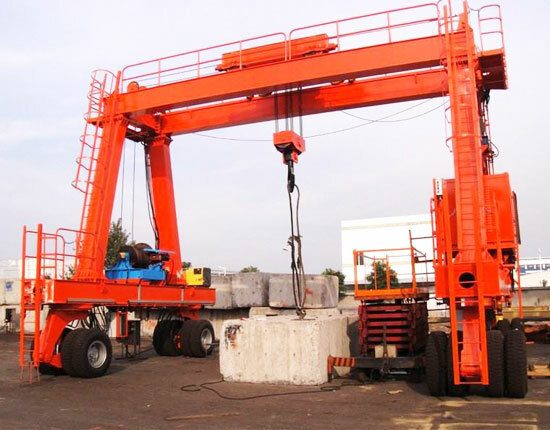 What to Consider When Selecting A Mobile Gantry Crane? 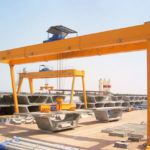 There are a few things you need to consider when selecting a mobile gantry crane for your businesses, but first you should focus on mobile gantry crane manufacturers and suppliers for that they are core factor in the crane selection process. A reliable supplier will not only provide strong and affordable lifting solution for your needs, but offer dependable services that satisfy you to the utmost. Thinking about several questions will be very helpful to narrow down the list of suppliers, such as how long have they been in the material handling industry, do they acquire relevant certifications like CE and ISO, how is the track record. 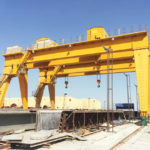 After narrowing down the list, you can focus on the specific requirements, including mobile gantry crane specifications (capacity, span, lifting height, hook coverage and things like that), specific uses, working environments and safety precautions. 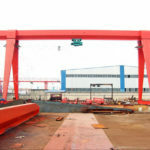 We supply a variety of gantry cranes to meet almost all needs of customers, such as full gantry crane, semi gantry crane, truss gantry crane, A frame gantry crane and hoist gantry crane. They are built with good quality and high stability. 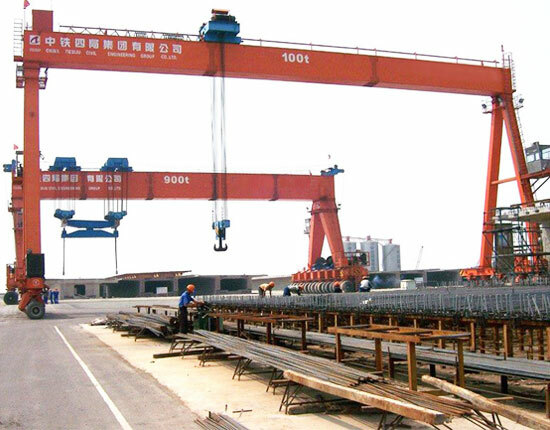 If you have any question about mobile gantry crane or any other type of crane, welcome to contact us online.